Power Bank Buyer's Guide: Have You Got the Power? Power banks have become a completely essential part of the mobile technology warrior’s kit; especially in the case of the iPad, which does not get longer battery life with each generation by design. Ten hours, more or less, is what you get, with Apple preferring any improvements in power efficiency be used to reduce size and weight, not run times. That’s great, but many of us either don’t always remember to charge all the way up or often have to be away from main power long enough that the 10-hour battery life of an iPad just won’t cut it. This is where a power bank comes to the rescue, letting us cart around extra power that can be shared almost universally between our different mobile devices. In this guide, however, we care about getting a power bank that will work well with an iPad, so keep that in mind. What is a power bank? Basically it’s just a lithium battery that’s been put into an external enclosure with some sophisticated charging circuitry. 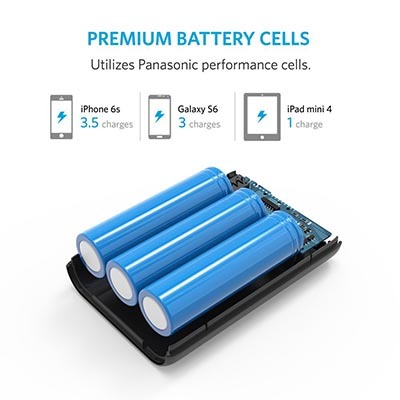 In the past few years lithium batteries have become dirt cheap and power banks, even the very good ones, rarely cost more than a handful of tens. The market is flooded with these things and it can be hard to know what to look for, so let me point out the most important aspects for you. The battery inside your iPad is rated in mAh or milliAmpere hours. Don’t worry too much about it, just know that the battery inside your power bank is also rated the same way. That’s what you see advertised on the box of a power bank. So if your device has a 5000 mAh battery and your power bank has a 5000 mAh battery, that means that you’ll get one full charge from it, right? Well, not quite. Sneakily, manufacturers rate these power banks at the voltage of the battery, but that voltage has to be stepped up slightly in order to charge your phone. There’s also some power lost as heat in the conversion process, and ambient temperatures also have an effect. So, in general, subtract roughly 15 percent from the quoted figure to get a more accurate idea of how many charges you’ll get. Also make sure you know what the mAh rating is for your model of iPad. The iPad Air 2, for example, has a battery rated at 7380 mAh. So a 10,000 mAh battery should get you about one full charge with some change. The next thing you have to consider is the speed with which a bank can charge your devices. While phones and other low-power devices can charge happily (albeit slowly) on the 0.5A that USB 2.0 provides as standard, iPads won’t even charge at all unless they are switched off. Your wall charger usually gives out more than 2A of current, which is why it charges your iPad more quickly. So you must have a power bank with a socket that will provide 2.1A or better in order to properly charge your iPad. Most these day, except for the very smallest, have dual USB sockets. One will have 1A and the other will be 2A+. Many power banks now feature intelligent voltage systems that will provide power as fast as the device asks for it, as long as it is within reach of that particular bank, that is. Also, power banks themselves take ages to charge, so it’s worth investing in a good 2A+ wall charger to get them juiced faster. Refer to the manufacturer’s documentation to find out what the best rating is for charging the bank itself. Finally, pay attention to the number of charge cycles the battery is rated for. The batteries in power banks tend to be less expensive than those in iPads, so they may only last for 500 charges, after which you’ll have to dispose of them. Still, that’s actually quite a lot. Obviously more expensive products may be capable of more. Although it is rare to find one without it, make sure your prospective power bank has all the protection technology it needs. Overcharge protection should be standard on all lithium battery devices and you can take it as a given. Although the packaging should still say so! Lithium battery fires are no joke. Which brings up another thing. The batteries inside power banks should not be handled roughly, immersed in water, or exposed to extreme temperature ranges. This not only messes up the battery but can cause injury as well. So be careful. Two batteries with the same mAh rating may be physically different in size because battery density and/or the number of cells can vary. Pay attention to the physical dimensions of the battery bank you’re considering, since that will determine if it will work in the situation you need it to. There’s no point in buying a monstrous 20,000 mAh battery if it won’t fit where you want to keep it. 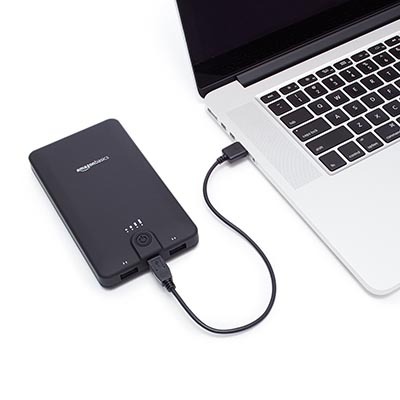 More and more we are seeing power banks that have a passthrough ability. All this means is that the power bank itself can be charged while charging other devices that are plugged into it. This means that you don’t need separate chargers to charge your power bank. Plug your wall charger into the bank and plug your phone and tablet in the outputs on the bank. Everything charges together. One power bank is pretty much like the next, unless it is a very low-quality unit. So sometimes special features can influence your decision between two products that are otherwise similar. Some power banks have integrated LED flashlights, which can be very useful indeed. The aforementioned passthrough feature can be essential to some. You may also want a ruggedized or waterproof one if you are going out in the wilderness or you work in construction. There are even power banks that come with solar charging, although you’d have to be pretty desperate for that. Also, while LED charge indicator lights are now standard, you may want a bank with a numeric readout for a more accurate idea of remaining charge. Power banks really help get rid of battery anxiety. I wish we had these at the outset of the smartphone revolution when batteries would die after half a day. Still, even today we don’t exactly have amazing battery lives for our devices. Thanks for checking out this guide, hopefully it will lead you to the perfect product for you. If you want some inspiration or don’t feel like shopping, head over to my power bank reviews to see which I think are the most deserving of your cash.